Who says that Legos are just for kids? Legos are a source of nostalgia for many adults that grew up building unique creations. With an abundance of licensed products and complicated kits, the demand for adult Legos is greater than ever. We’ve used our experience with these building blocks and the wealth of reviews on numerous platforms to present you with the best Lego sets for adults that money can buy. Legos have a long and illustrious history of being the go-to toy for adults and girls alike. The recognizable bricks we’ve all come to know and love were first introduced in 1949. Since then, the toy giant has created multiple lines of products to cater to specific demographics. From licensed sets of popular movie and book franchises to themed kits to create three-dimensional worlds, the Lego franchise has a wide range of products to suit anyone’s creative mind. While the brand is often known for catering to younger audiences, they have also released many kits that are designed to challenge the mind while educating builders on architecture, history, and construction. Some of the more difficult sets can include thousands of pieces and require hours of work to put together. They act as a three-dimensional puzzle and bring both fictional and real-world structures to live in your very own home. In the 1960’s Lego released their “Scale Model” brand. Targeted towards adults, this line included a book on architecture and allowed people to design and plan their own home. Decades later, Lego took this idea a step further and started to release sets that replicated landmarks around the world. Lego’s “Architecture” line was first introduced in 2008 with the release of the Sears Tower model and continues to go strong with new releases each year. The line includes notable buildings like the Eiffel Tower, the White House, and much more. Each set comes with detailed instructions as well as information about the building’s history and architecture. This unique approach centered around architecture and education has been used with fictional locations and structures as well. What Lego Sets Did We Consider? We had a plethora of options to consider given Lego’s expansive catalog. To qualify for this list, the set has to be readily available for purchase in 2017. To further narrow down the choices, we took a look at the overall complexity of the set. There are no simple options that can be completed in minutes. We went with large Lego sets for adults filled with intricate designs and details fit to challenge the mind. When it came time to rate these sets, we took a number of factors into consideration. We checked out a number of reviews to get a better idea of how other fellow Lego enthusiasts feel about the set. We took into account their personal reviews, paid attention to their lists of pros and cons, and looked at the overall popularity of a set from various retailers. Of course, we also used our own personal preferences and opinions on the set to make the final decision. We used our own experiences as adult Lego builders to judge each individual set. While everyone has their own style of building, most are particularly keen on a challenge. Lego kits for adults are typically made with unique components not found in standard kits and are designed to engage you in a challenging build and overall complexity. These are three-dimensional puzzles after all, so why not go with something that takes time and a thoughtful mind to complete? The chosen sets are all on the larger side. They can’t be completed without looking at the instruction and come with an attention to detail that’s perfect for adults. We chose sets that can keep you engaged throughout the build and make you want to display the final product. Many of these sets also come with a sense of familiarity. You’ve seen these designs and have a general sense of how they look to ensure that you don’t go into the project blind. Whether you’ve seen them on television or in real life, having that basic understanding of the design adds a unique aspect to your build. 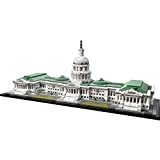 This model of the Capitol building is one of the best Lego sets for adults because of its sheer difficulty and beauty. The iconic Washington landmark is known for its neoclassical architecture and detailed design. 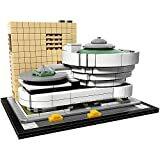 This set of over 1,000 pieces allows you to recreate the building in all its glory. It comes with many of the building’s signature design elements. You’ll find numerous columns, a removable dome, an accessible rotunda, and much more. Many of these pieces, such as the statue elements, are unique to this kit and can’t be found on traditional sets. The set also comes with an informational booklet that helps you understand the architectural design and history of the Capitol building as you assemble it. It’s the symbol of American democracy and designed to be displayed when you’re finished. To complete your collection of staple landmarks in Washington, DC, you can go with the White House model from Lego’s “Architecture” line. It’s a moderately-sized replica that’s comprised of 560 pieces. When finished, this set stands just under 4-inches tall and approximately 9-inches wide. The adult Legos come with all the detail you need to admire the building up close and personal. From the large entrance columns to the manicured lawn, the intricate set is a real-world reproduction. It’s based off the historic design by James Hoban in 1792. As with all the sets in the “Architecture” line, the White House set comes with a booklet to inform and educate. It also has a wide base with a printed label for easy display. Recreate the city that never sleeps with this NY City Skyline set. It’s on our list for best Lego kits for adults because it provides you with the best NYC has to offer in one package. Instead of building a single landmark, you’ll have the opportunity to create replicas of five separate architectural beauties. It includes the Statue of Liberty, Flatiron building, Chrysler building, Empire State Building, and the new One World Trade Center tower. The set contains 598 pieces and includes details that make each building unique, such as the smoothness of One World Trade Center and the grid lines of the Empire State Building. The only gripe is that the Statue of Liberty is fairly simple compared to the other landmarks. However, as a whole, the set is unmistakably New York City. The attention to detail and unique look of this Guggenheim replication make it a stunning addition to a New York-themed collection. The iconic museum is known for its modern design that includes circular shapes and distinct lines fit for the future. This kit includes unique building components to accomplish the unorthodox architectural design. These include smoothly rounded panels and large dome pieces. In addition to the main building, the set has the annex tower thrown in. Its hard edges and the grid-like pattern is the perfect juxtaposition of the main building’s smooth appearance. To finish off the replica, the set includes a small chunk of New York City’s 5th Avenue. It’s meant to represent Museum Mile and comes complete with two yellow cabs that have a minimalistic appearance for cohesion. The set is built using 744 pieces and measures 4 inches high by 7 inches long and 5 inches deep. 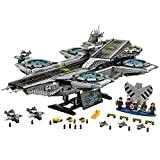 This Lego Marvel Helicarrier is among our best large Lego sets for adults because it perfectly captures the science fiction nature of the comic book universe. Sidenote, if superheo legos are your thing, we have you covered with our best superhero lego sets list. The set contains just under 3,000 pieces, so it will take a lot of time and dedication to finish it. The main helicarrier has detailed armor, movable rotors that can be powered with an additional kit, and plenty of room to house all the extras. It comes with miniature figures of Nick Fury, Black Widow, Captain America, Hawkeye, and Maria Hill to round off your Avengers collection. It also comes with a SHIELD stand for display. There’s also 3 microscale Quinjets, 3 fighter jets, multiple trucks, and a variety of accessories to make it unique. Don’t think that the inside is neglected! A detailed cockpit can be built and viewed through translucent panels on the exterior. Overall, this massive set has all the components needed to show off your favorite superheroes.